I hate whiners. Okay maybe hate is too strong a word. There definitely are things that I do hate. I hate when children are mistreated and abused. I could say I hate child abusers but what if they themselves were abused? They are part of a hideous cycle but make note I don’t excuse what they are doing. I guess using the word hate, truly is too strong for how I feel about whiners. Let’s just say, I get annoyed by people who whine. Ironically, reading what I have written thus far sounds a lot like whining. I did not intend to write about whining or my dislike of it. My intent was to let you know that PaisleyPerspective content will increase. Girl Scouts honor, it will. And no I do not have my fingers crossed behind my back. There have been so many stirrings and ideas in my head to share with you. I thank those who stop by and look at older post as well as get inspiration. The most read post is still “Peace Be With You”, which warms my spirit. March is Women’s History month and I want to be sure that women around the world are highlighted. There are women and girls who today are still fighting for equality. Even in nations where women are Presidents and Prime Ministers there is still extreme sexism. Here in the United States, there have been 44 male Presidents elected and definitely is time for a woman President to be elected. I started with the statement, I hate whiners. I will end with the reason why. We can’t change much when we whine. 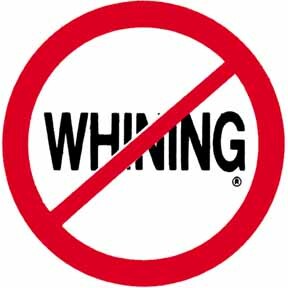 Whining annoys people and you may get a small part of what you hope to have or gain. Whining about your current condition or world events will not change them. Being present in your own existence, taking time to understand issues will help toward change. It is easy to be cynical but it is hard to be optimistic sometimes and believe that you can bring change.